We are closed for lunch everyday from 12:30 - 1:30. Have a question? Check out our FAQ page first before giving us a call. We are a 5 star rated business! Read real testimonials from our patients. Feel free to call us at any time during office hours. We strive to run on time because we know you are busy and your time is valuable. It is a rare even that we run more than 15 minutes behind schedule. So we can continue this benefit for our office, we ask you to be on time as well. Please call us at least two business days in advance if an emergency occurs and you need to change your appointment. Missed appointments without notification create downtime that increases the overall cost of dental care. To help you remember scheduled appointments, we send text messages and/or email messages two days before your appointment. If you need to change your appointment you may reply to the message at that time. 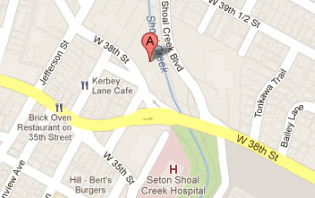 We are centrally located one block west of Seton Hospital on 38th Street.